Last week I asked the question: What is possible? I guess this one was a tough question for me since it will span two weeks in my QOW series. I was surprised by the fight my psyche put up when I forced myself not to just fill in the blanks each day with my answer, but to sit with the question for a while. Honestly, it scared the S*** out of me. So what is possible? In a word, EVERYTHING is possible. There are very few things I can think of that would not be possible if I apply the right intention, attention, and execution. When this answer came to me, my inner control freak really freaked out. I’ve been reading The Icarus Deception by Seth Godin in preparation for our live book club discussion on The Why and The Buy podcast. This book will turn a lot of your preconceived notions about success upside down. Seth talks about changing your framework for success from being “right and coherent” to being “innovative and interesting”. I’ve been doing the RIGHT thing my whole life. Tell me the rules and the boundaries and I’ll be your best performer. Throw out the rules and the boundaries and I’m a little lost. Well, I’m tired of just being RIGHT and I’m ready for what is EARTH-SHATTERING, INNOVATIVE, and INTERESTING. How about you? 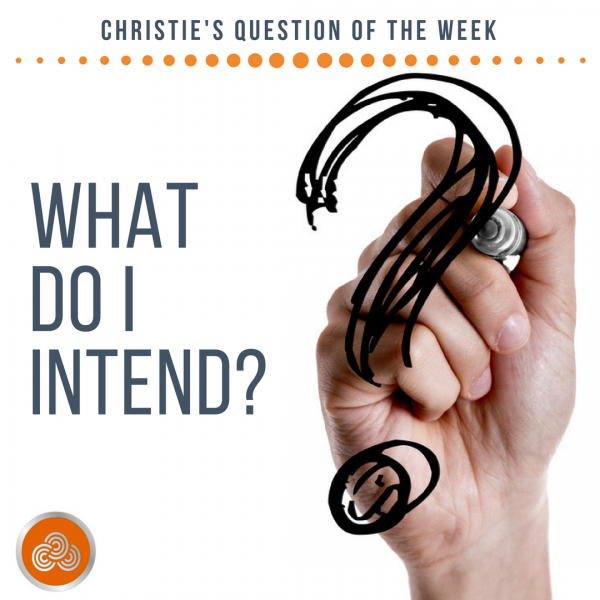 Now that you know what is possible, it’s time for a new Question of the Week: What do I Intend? You know the drill. Write down three things that come to mind when you ask yourself What do I Intend. Do this each day and see what you discover. I’m interested to see what we each have at the end of the week. Share your story. Share your observations. Let’s see what’s possible together.